Tips to decorate your blank wall!! How to decorate a Large, Blank Wall? Don’t be intimidated — a big, windowless wall can be the perfect canvas for creative decor ideas. Giving your walls a unique treatment or finish is a great option for completely changing the look or ambiance of your home. Here are some ideas that will bring some style to a blank wall …. Wallpaper makes an interesting backdrop to a room. People often get scared or overwhelmed by the idea of going too extreme, but a dramatic paper choice used on just one wall of a room can create that “wow” element that every room needs. Wallpaper today comes in a variety of modern and contemporary colours and patters. Advances in technology have also made wallpaper easier to both apply and remove. 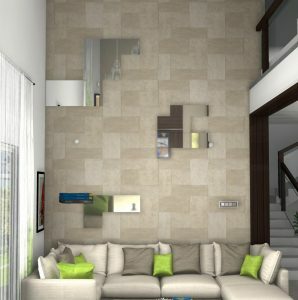 A wall mural is a great way to add ambiance and style. Wall murals are an easy way to add color, depth and texture to any room. 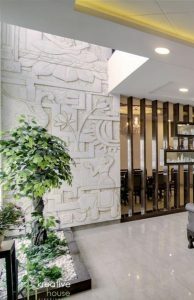 An interesting mural adds glamor to an enormous wall, especially when there are ultrahigh ceilings involved. These murals can be used for both exterior and interiors. 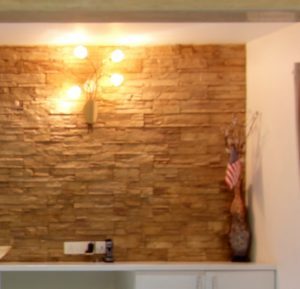 Another fabulous way to cover a blank wall is to cover a wall completely with the stones. This will give a beautiful effect. It adds texture and an interesting look to the entire space. You can add texture to your walls using textured paint. Textured walls have become a growing trend because they can take on aesthetics from fine linen to bold geometric forms. The textured paint finish is available in many color trends such as metallic finishes gold, silver and copper. Glossy and shiny finish of textured paint can also be obtained. Beauty of using texture paint is the ability to spark a mood in a space without having to change out the furnishings, flooring, and architectural details. Another great way to cover the blank wall is by using wall decal. 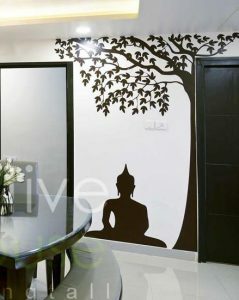 A wall decal, also known as a wall sticker. Decals can range from simple small wall borders to more complex covering entire walls. 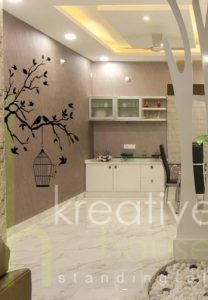 These decal designs have a matt/satin finish, giving the impression that the design has been professionally painted on your wall. Hope you get inspired with these ideas!! Tips to design a perfect luxurious bedroom!! An elegant home full of style in Hyderabad! !